I found these baskets on Decor Steals over a year ago. Last year, I used them on our front door with three types of artificial flowers: tulips, summer flowers, and fall flowers. They will all be making a return visit during the appropriate seasons this year. Daffodils are currently making their first appearance in the baskets. When I initially placed them in the baskets, they needed something else. That led me to try making the bows out of plaid wired ribbon that I had on hand. Now they make me happy! I tie them to the door in two places so they are not constantly tipping to one side or the other. If the flower stems are too short, I fill the bottom of the baskets with bubble wrap. I attached the bows with a twist tie. Your door baskets are so pretty! 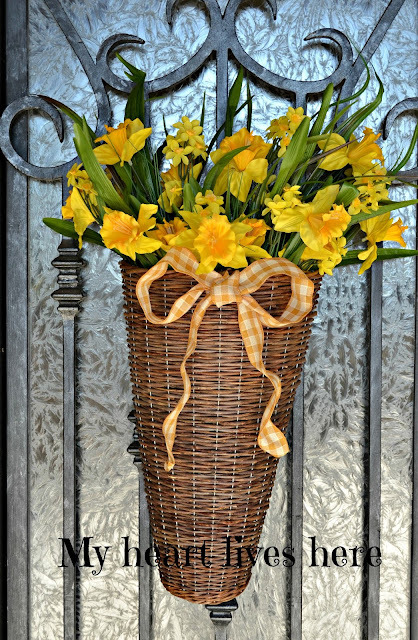 How could you not love the daffodils and that beautiful ribbon? Pinned. It's cold and windy here today, but your flowers are making me think spring!! So pretty! Thanks, Cindy. We have had everything from hot to cold weather here over the last month. Happily, it was nice and sunny when I was hanging the baskets up. I love these types of baskets! I have one myself and use it quite often. Your daffodils are so pretty and I love your tips on using them as well! Love your cheery door decor. I see you have an iron and glass door as well, I'm happy that you shared your tips on how to attach welcoming decor! I so enjoyed our luncheon yesterday, so great to meet you! I love your door basket! It makes me think of Spring. I know what you mean by those baskets wanting to tilt. I've had that problem before when using one on my door. Love the cute ribbon you added. It's the perfect touch. Hi, hopped over from Poofing the Pillows. 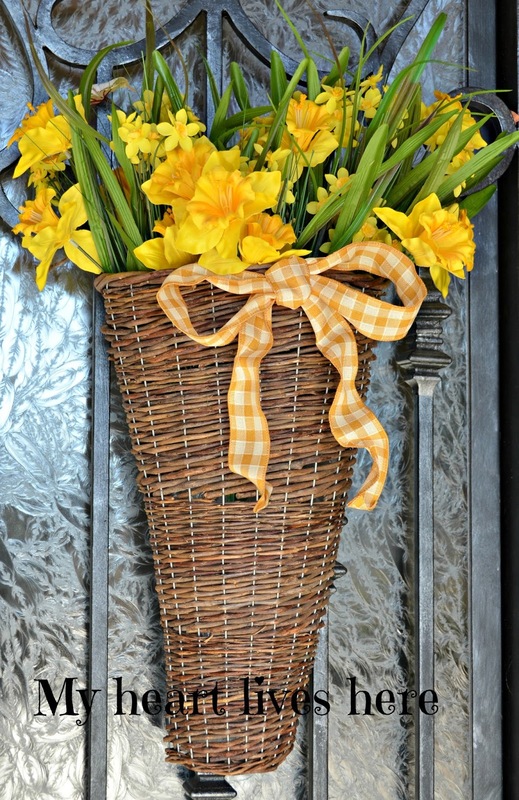 I love the basket and if I didn't have Spring fever before, those daffodils sure made me have it now! lol! I co-host a link party, Share Your Cup Thursday. It's about sharing the things that make you happy. Would love if you shared some time! Thank you, Jann. I look forward to it. Now that is a happy arrangement! Thanks for sharing at Home Sweet Home! How can daffodils not bring a smile to one's face? You created such a joyful arrangement. Great job. I saw your link at Cindy's Amaze Me Monday party. Hi Eilis, wanted to thank you for sharing at Share Your Cup! 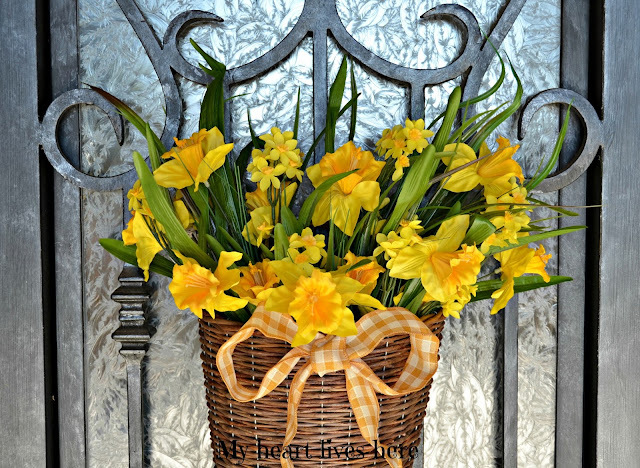 Oh how pretty your basket of daffodils are! It is snowing here in the Nashville area today and I am so wanting Spring to be here!! These are so beautiful! I've always loved when the daffodils popped up in the spring. Sadly, I don't see many here in Fl, except for the florist!